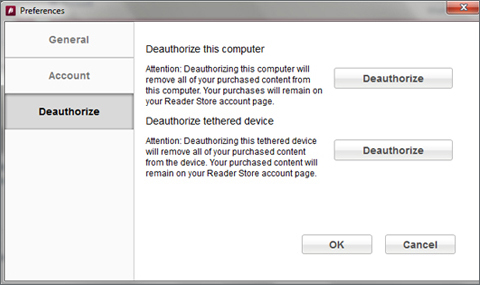 De-authorize a Reader Digital Book or computer from your account using the Reader for PC or Reader for Mac software. Once the software has finished starting up and you are on the Reader for PC screen, press and continue to hold the Ctrl + Shift key on your computer keyboard. With the keys still pressed, click Edit and then click Preferences from the menu. NOTE: Depending on your reader device, you may need to touch Data Transfer Mode on your Reader device. Once the software has finished starting and you are on the Reader for PC screen, press and continue to hold the Ctrl + Shift key on your computer keyboard. Once the software has finished starting up and you are on the Reader for Mac screen, press and continue to hold the command + Shift key on your computer keyboard. 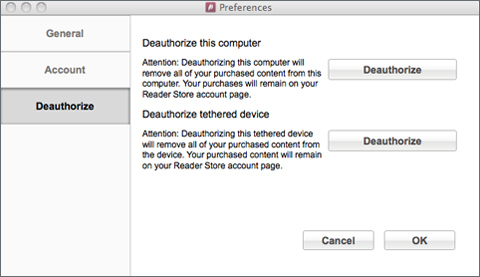 With the keys still pressed, on the menu, click Reader for Mac and then click Preferences. Once the software has finished starting and you are on the Reader for Mac screen, press and continue to hold the command + Shift key on your computer keyboard.